Using the resale sites (and some money we made selling clothes) we turned stroller A into stroller B for a major upgrade! Used stuff has come a long way since I was a kid. Sure thrift stores still exist, but now you can also buy used kids stuff on Facebook from families in your community. If you are already a pro, no need to read on. However, if this concept is new to you, might be worth the read. In Folsom, where we live, there are two main groups with thousands of moms selling used kids’ items. If you search “moms” and/or “kids” with the name of your neighborhood, similar groups will likely pop up, (and, if they don’t, you could always be the first to set one up!). Usually the groups are closed, so your profile will need to state your location in order to be added. I wish someone had shared these groups with me before E was born because I am sure it would have saved us money. Then again, purchasing the new stuff is kind of a rite of passage. You think you want everything fresh for your baby, then he or she arrives and you realize how quickly you go through different items for different stages. That’s the beauty of it. Most of what I have purchased has been practically new and what I have sold has been the same, (do you know how many baby outfits she wore only once?). In our case, I regularly go through her clothes, toys, and other items and post anything I would not use (or do not want to store) for our next baby. I save the cash received for use toward future items. For example, I got an entire summer wardrobe of cute, minimally-used clothes for just $7. 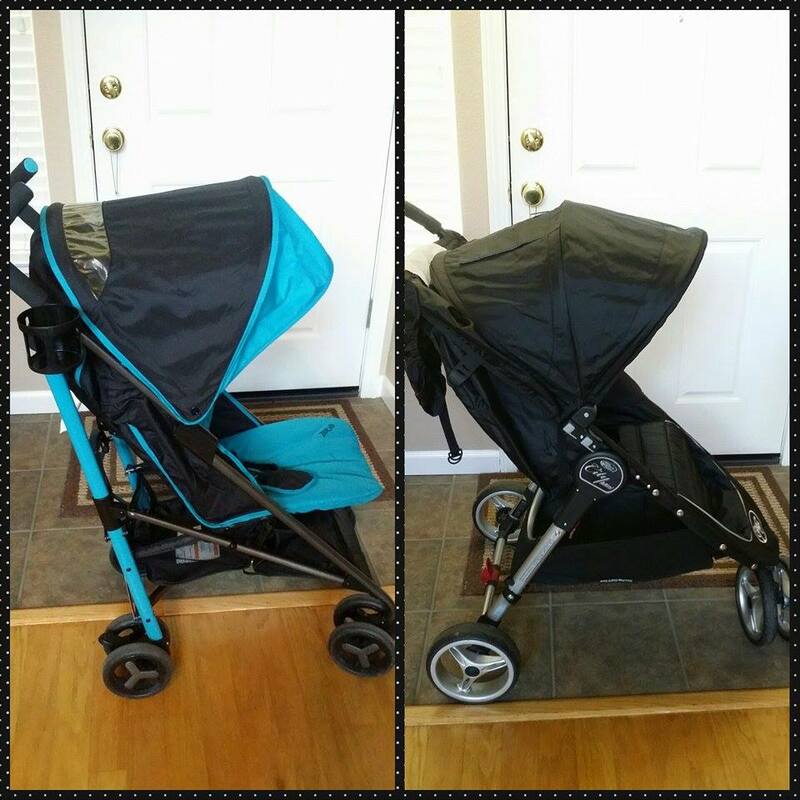 I also sold our umbrella stroller and threw in just $60 to upgrade to a compact jogging stroller. Barely-worn shoes, toys, the list goes on! You can see the profile of the person you are going to meet, which helps minimize the “stranger danger.” I often note if we have friends in common and stalk through a few photos. You can leave items on your porch for pick-up, eliminating the awkward examination of used goods and making it super easy to collect cash. My husband often laughs when I pull out an envelope of money from under our welcome mat. “What did you sell this time?” is a common question around here. Unlike Craig’s List, the community is moderated. If someone is repeatedly reported for breaking group rules, they get removed. I am pretty sure this helps eliminate people who yell at you for not being willing to deliver a free crib. Yes, that is my Craig’s List sob story. Items generally sell for about half of what they cost new. This has opened up our baby gear collection to brands and items I wouldn’t have considered purchasing otherwise. Toys often sell at even greater markdowns, while babywearing wraps and carriers have their own niche groups and often sell at or above retail if hard to find, (HTF). It’s also a wonderful way to cut-back on the guilt of consumption. I read an article about how many barely-used breast pumps end up in landfills. Sites like these help to conserve resources and lessen waste. If you’re new to resale groups, here is how it generally works: Someone will post a picture and description of the item for sale, along with pick-up information and price. You comment with Int (interested) or NIL (next-in-line) if you would like to purchase. The seller will then contact you with a private message. If you decide to pass, the next person in line will be contacted. There you have it! Children’s shopping made cheap. Just be warned, it is also addictive.